« First Green Drinks of 2012!! Transition Cowbridge is very excited to be able to announce the launch of a veg box scheme that will be using locally grown organic produce.Riverside Market Garden (www.riversidemarketgarden.co.uk) is a community owned social enterprises that has been producing fresh veg in on the outskirts of Cowbridge (St Hilary) for over a year.Currently the majority of their veggie boxes go to the Riverside Farmers Market in Cardiff however they are keen to offer their produce to the local area of Cowbridge and the surrounding area. Transition Cowbridge is 100% in support of this as its a great opportunity to not only support a local community owned enterprise but also increase local resilience through the increased supply of healthy local produce. As it stands the plan is to deliver the boxes to the Little Shop of Calm (opposite Natwest Bank) on a weekly basis and people can order them weekly or bi monthly. 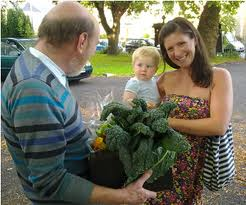 Please see http://www.riversidemarketgarden.co.uk/buy.htm for specific details on how to sign up for a veg boxes as well as details on their community share scheme (Currently it does not mention Cowbridge on this page but same contact details apply). And finally please circulate this to any other keen veggie munchers that you know in the local area.